A new fund of up to £2 million to protect and enhance Scotland’s nature has been launched. Scottish Natural Heritage has issued a call for ambitious ideas to improve habitats, safeguard species and encourage increased access to nature. 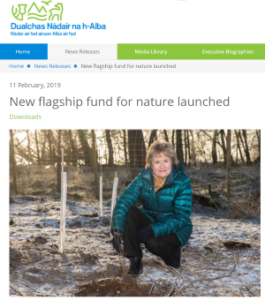 Up to £2million will be available through the two-year Biodiversity Challenge Fund, which was announced in the Scottish Government’s programme for government last year. The first year of the fund is now open, with up to £1million of investment available in 2019/20. The funding will support large-scale projects that aim to deliver rapid change on the ground to increase the health and resilience of our natural environment. SNH is particularly seeking innovative ideas that will help our most at-risk habitats and species, including mammals and birds, connect existing nature reserves and protected areas and tackle invasive species.